Very High Energy Gamma-Ray Astronomy is a research subject which has components of Cosmology, where we study the origin and the evolution of the Universe from the Big Bang until now, of Astronomy and Astrophysics, where we study, among other objects, the properties of stars and galaxies, and Particle Physics, where we try to understand the properties of fundamental particles like quarks and electrons and their interactions. We usually shorten the three words “Very High Energy” by simply writing “VHE”. In our group we are interested in understanding the VHE gamma-ray emission from cosmic sources in the sky which can be either in our own Galaxy or beyond our Galaxy. And in particular, we have more experience in the analysis and interpretation of what are the energetic processes in cosmic sources which are very far away from us, i.e. we mostly work in what is called “extra-galactic astronomy”. You can find a list of all our publications at the Linnaeus University website. 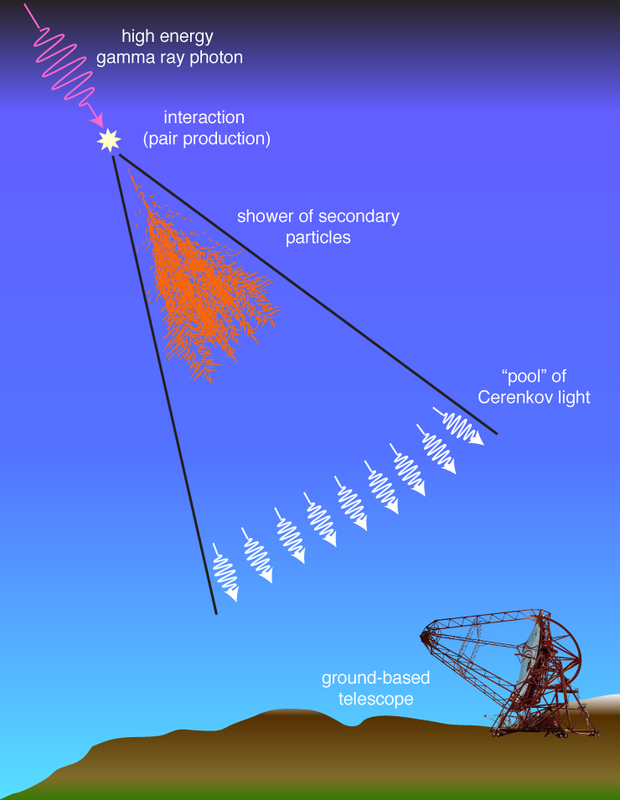 VHE gamma-rays are photons which have an energy tipically above 100 GeV (GeV = Gigaelectronvolt) and can be detected from the Earth’s ground in two ways: by using Imaging Atmospheric Cherenkov Telescopes (also known as IACT, see picture above) and by using the technique called “High-Altitude Water-Cherenkov” detection in Extensive Air Shower (or EAS) arrays. ALTO belongs to this second category of EAS arrays, in which by going at higher altitudes, one can “catch” the point at which the development of the shower of secondary particles is maximum. The Astroparticle Physics group at Linnaeus University is proposing the construction of ALTO, a new Air-Shower Array experiment in the southern hemisphere, the conception, the design and the prototype of which will be carried out at Linnaeus University by our group, in collaboration with other interested parties.